PCB and IP buoyed the healthy results for Q4. Marking the highest quarterly revenue increase in 5 years, the Electronic System Design (ESD) Alliance reported today that EDA revenue increased 18.9 percent for Q4 2016 to $2.455 billion, compared to $2.0645 billion in Q4 2015. The four-quarters moving average was up by 9.2%, which compares the most recent four quarters to the prior four quarters. He speculated that the growth in PCB tools might be attributed to the healthy amount of system-level design activity, as well as advanced packaging activities for multi-chip design. In IP, the actual reporting companies for the quarter were up a little more than half the amount that the non-reporting companies were. Reporting companies were up 15%, and the non-reporting companies were up 25%. 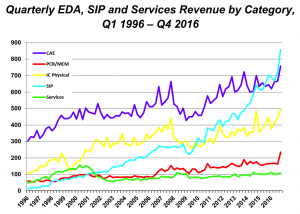 “IP has consistently been strong in recent years. In this case, it was skewed more toward the non-reporting companies,” Rhines said. Double-digit growth was seen in Q4 for all four geographic regions – Americas, Europe, Middle East and Africa, Japan, and Asia/Pacific, with the Americas reporting more than $1B for Q4, an all-time record, and Japan grew in double digits for the full year. All product categories also saw very solid fourth quarter growth with CAE, Semiconductor IP, IC Physical Design & Verification and PCB/MCM reported double-digit increases. By product category, Computer Aided Engineering generated revenue of $757.5 million in Q4 2016, 17.4% above Q4 2015. IC Physical Design & Verification revenue was $495.6 million in Q4 2016, 11.5% higher than Q4 2015. Printed Circuit Board and Multi-Chip Module (PCB & MCM) revenue of $235.4 million for Q4 2016 represents an increase of 42.5 percent compared to Q4 2015. 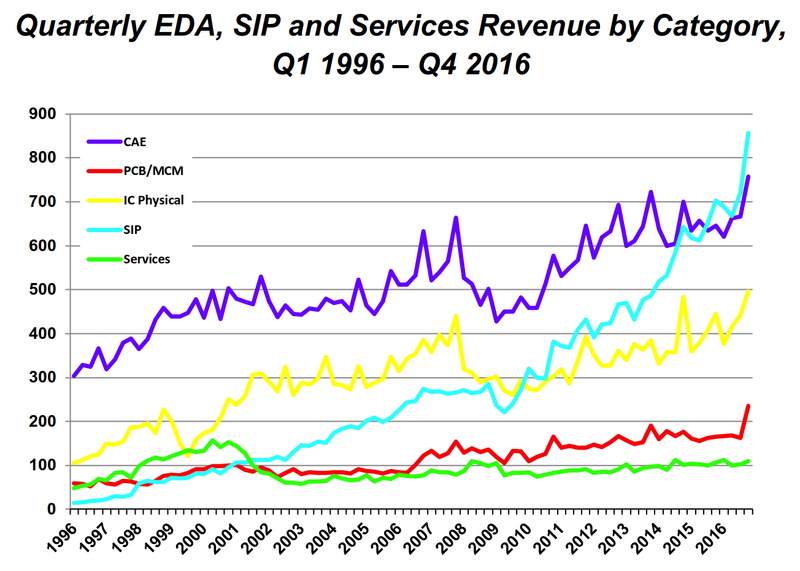 Semiconductor Intellectual Property (SIP) revenue totaled $856.4 million in Q4 2016, a 22% higher than the same quarter last year. Much of this activity was likely affected by the adoption of 14 and 7nm process technologies. Rhines also pointed out that not only was there 18.9% growth in the quarter for quarter/quarter for the total industry, but also the people grew 6.6% versus a year ago.